HEY LADY. – Hello? I Forgot My Mantra. Published on September 4, 2014 September 4, 2014 by i forgot my mantra. Once, when I was an intern at the Today Show (many, many moons ago), I was seated by the door of the Green Room when Joan Rivers poked her head in, looked down at me, as I looked up, and said “Hey Lady,” before turning and leaving. It’s a phrase I now use ALL THE TIME. Anyway, I’ve always kind of liked Joan–she was coarse, yes, but a hard-worker. She had ups and downs but she kept going. And she was funny. Below, I’ve copied some highlights from an old New York Magazine profile of Joan Rivers. 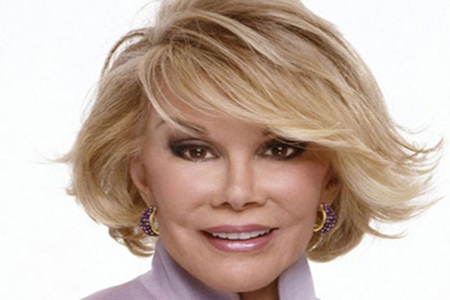 –The Joan Rivers diet: You can eat anything you want before 3 p.m. and then nothing for the rest of the day. –At Sundance, Rivers wears a slight variation of the same all-black outfit every day. Today: Donna Karan sweater, Chanel slacks, Manolo boots, full-length sable fur, huge sunglasses. Categories Joan will be missed.